India is the seventh-largest country by geographical area, the second most populous country, and the most populous democracy in the world. 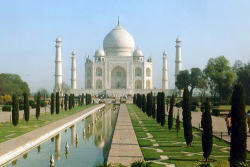 It is one of the oldest civilizations in the world with a kaleidoscopic variety. Home to the Indus Valley civilization and a region of historic trade routes and vast empires, the Indian subcontinent was identified with its commercial and cultural wealth for much of its long history. Religion is central to Indian culture, and its practice can be seen in virtually every aspect of life in the country. In a country as diverse and complex as India, it is not surprising to find that people here reflect the rich glories of the past. The Indus Valley civilization, one of the oldest in the world, dates back at least 5,000 years. Aryan tribes from the northwest infiltrated onto Indian lands about 1500 B.C. ; their merger with the earlier Dravidian inhabitants created the classical Indian culture. Arab incursions starting in the 8th century and Turkish in the 12th were followed by those of European traders, beginning in the late 15th century. By the 19th century, Britain had assumed political control of virtually all Indian lands. Nonviolent resistance to British colonialism led by Mohandas Gandhi and Jawaharlal Nehru brought independence in 1947. Despite impressive gains in economic investment and output, India faces pressing problems such as the ongoing dispute with Pakistan over Kashmir, significant overpopulation, environmental degradation, extensive poverty, and ethnic and religious strife. India’s diverse economy encompasses traditional village farming, modern agriculture, handicrafts, a wide range of modern industries, and a multitude of services. Services are the major source of economic growth. Tariff spikes in sensitive categories, including agriculture, and incremental progress on economic reforms still hinder foreign access to India’s vast and growing market. Privatization of government-owned industries remained stalled in 2006, and continues to generate political debate. The economy has posted an average growth rate of more than 7% in the decade since 1996, reducing poverty by about 10 percentage points. India achieved 8.5% GDP growth in 2006, significantly expanding manufacturing. India is capitalizing on its large numbers of well-educated people skilled in the English language to become a major exporter of software services and software workers. India constitutes the major portion of the Indian subcontinent. India’s northern and north-eastern states are partially situated in the Himalayan Range. The rest of northern, central, and eastern India consists of the fertile Indo-Gangetic Plain. In the west, bordering south-eastern Pakistan, lies the Thar Desert. Southern India is almost entirely composed of the peninsular Deccan plateau, which is flanked by two hilly coastal ranges. India is home to several major rivers, including the Ganges, the Brahmaputra, the Yamuna, the Godavari, the Kaveri, the Narmada, and the Krishna. The climate of India varies from tropical in the south to more temperate in the Himalayan north, where elevated regions receive sustained winter snowfall. India’s climate is strongly influenced by the Himalayas and the Thar Desert. India’s culture is marked by a high degree of cultural pluralism. It has managed to preserve established traditions while absorbing new customs, traditions, and ideas from invaders and immigrants; multicultural concerns have long informed India’s history and traditions, constitution and political arrangements. The earliest literary traditions in India were mostly oral and were only later transcribed. Most of these are represented by religious texts. Among many notable Indian writers of the modern era, using both Indian languages and English, Rabindranath Tagore is perhaps the most famous. The Indian film industry is the world’s most prolific; its most recognizable face is the Mumbai-based “Bollywood”, which produces commercial Hindi films. Religious practices are an integral part of everyday life and are a very public affair. Traditional Indian family values are highly respected, although urban families now prefer a nuclear family system due to the socio-economic constraints imposed by the traditional joint family system. India has been a major seat of learning for thousands of years. While some of the country’s universities (BITS, NSIT, ISB, IITs,BHU,IIITs, NITs, IISc, TIFR, ISI, IIMs,AAFT, AIIMS) are among the world’s well-renowned, it is also dealing with challenges in its primary education and strives to reach 100% literacy. Universal Compulsory Primary Education, with its challenges of keeping poor children in school and maintaining quality of education in rural areas, has been difficult to achieve. All levels of education, from primary to higher education, are overseen by the Ministry of Human Resource Development (Department of Higher Education (India) and Department of School Education and Literacy), and heavily subsidized by the Indian government, though there is a move to make higher education partially self-financing. There are broadly four stages of school education in India, namely primary, upper primary, secondary and higher secondary(or high school). Overall, schooling lasts 12 years, following the “10+2 pattern”. Higher education in India has evolved in distinct and divergent streams with each stream monitored by an apex body, indirectly controlled by the Ministry of Human Resource Development. and funded by the state governments. Most universities are administered by the States, however, there are 18 important universities called Central Universities, which are maintained by the Union Government. The increased funding of the central universities give them an advantage over state competitors. The Indian Institutes of Technology were placed 50th in the world and 2nd in the field of Engineering (next only to MIT) by Times Higher World University Rankings although they did not appear in the Shanghai Jiao Tong University Academic Ranking of World Universities. The National Law School of India University is highly regarded, with some of its students being awarded Rhodes Scholarships to Oxford University, and the All India Institute of Medical Sciences is consistently rated the top medical school in the country. Indian School of Business, Hyderabad and the Indian Institutes of Management (IIMs) are the top management institutes in India. The private sector is strong in Indian higher education. India has a large number of Distance education programs in Undergraduate and Post-Graduate levels. The trend was started originally by private institutions that offered distance education at certificate and diploma level. By 1985 many of the larger Universities recognized the need and potential of distance education in a poor and populous country like India and launched degree level programs through distance education. The trend caught up, and today many prestigious Indian Universities offer distance programs. Indira Gandhi National University, one of the largest in student enrollment, has only distance programs with numerous local centers that offer supplementary contact classes. Many students from Myanmar have studied in India. There are known issues of quality in many universities, sometimes professors don’t come to teach, classes are not in English even though they are meant to be, etc. Registration is sometimes difficult due to the large amount of documentation that may be required for Myanmar qualifications.